This week I went to the Publishing as Praxis presentation by Nick Thurston, an artist practitioner and scholar based in the School of Fine Art, History of Art and Cultural Studies. The talk was organised by the Centre for the Comparative Histories of Print, which incorporates scholars from schools such as English, History, Medieval Studies, Fine Art, and Design. The talk was presented as an overview of Thurston’s practice, rather than a traditional paper presentation, and covered such diverse topics as talking animals, repressed histories of self publishing, public libraries of dissent, the objectification of speaking, voice synthesization, database management, computational capitalism, and media theory as a question. The thread running through these topics related to different aspects of publishing, described as “the long history of making language public”. As part of his presentation, Thurston described particular projects he had been involved with as part of Information as Material. One such project, ‘I, Sparkie’ is a recent publication produced as a limited edition of 350 and edited by Thurston himself. As Mark Dion described in his foreword to the book: “I, Sparkie represents a rich and unusual archive relating to the life of a real budgerigar, Sparkie Williams, who was raised and trained in Newcastle, England by Mrs Mattie Williams. Between 1954-58 Sparkie came to be recognised as the world’s most famous talking animal. His vocabulary included over 500 words; he won awards and a place in the Guinness Book of Records; his voice was used on pop records and bird seed adverts; his dialect was distinctly Geordie; and his taxidermied remains have their own strange history of display”. Written and compiled by Northern Irish artist Andrew Dodds, the book revealed “an [extensive] artistic study of Sparkie’s history and the relations of that history to the natural sciences, museology, the voice, human/non-human relations and the government of ‘nature’.” Accompanied by an 18 minute CD recording of Sparkie learning to talk, the work also considered wider questions in animal studies and language, which are explored in the invited essays by academics John Mullarkey and Robert Williams. As illustrated by the nature of the Information as Material project, printed matter is only one form of publishing, which can also extend into exhibition practice and installation. The exhibition Do or DIY, which ran from 9th March – 16th April 2012 at Whitechapel Gallery, London, aimed to showcase this expanded definition of publishing, through the production of a free to handle reference library of self published books in the form of a gallery installation. 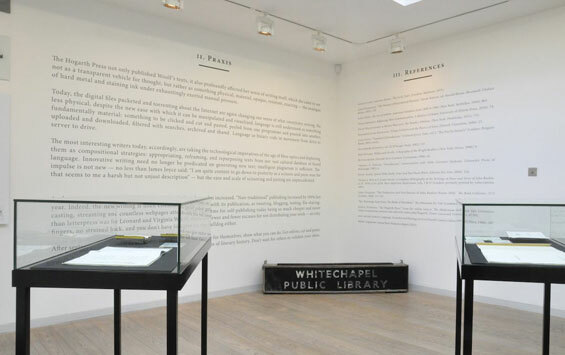 The six week exhibition marked the end of a year long Writer in Residence programme held at the Whitechapel Gallery, and elaborated on a previously commissioned essay by the editors on the history of self-publishing. As reflected in the title, the essay and subsequent exhibition advocated a strong DIY approach, in opposition to previous criticisms against ‘vanity publishing’. For Information as Material, the sentiment is clear: “Don’t wait for others to validate your ideas. Do it yourself”. The essay and exhibition cited previous examples of rejected, and subsequently self-funded, publications by writers now canonised in English literature. In doing so, they aimed to “present a set of ideas and artefacts that reveal the concealments required by the value structures that underwrite canonising historiographies and culture industries”. Ideas about temporary libraries and publishing continued into Thurston’s own practice in the exhibition Pretty Brutal Library which was exhibited at &Model, Leeds from 25th July – 14th September 2013 (discussed in Week 46). The exhibition was first conceived of following a commission by the Hannah Mitchell Foundation to produce a new print work. 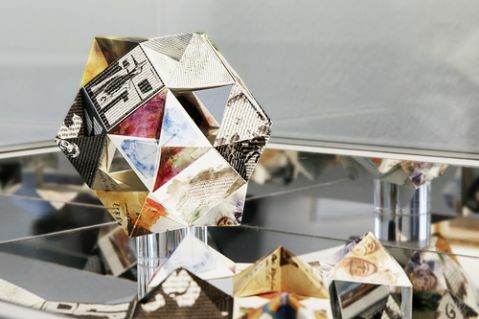 The print work, in the form of a bookmark, folded to create a free-standing microstructure, and contained a doublet composed with American poet Kim Rosenfield. This two-part text “The Brute Material of Words / The Brutal Material of Worlds”, also became a focal point of the exhibition, as each part was featured in large vinyl letters, on opposite walls of the gallery space. These forms of self-publishing and alternative press open up ideas as to what words and language mean in a visual art context, from written forms and typography, to the spoken word, and synthesized speech. Most of all, it highlights the imperative to embrace forms of open source and open access culture, in order to pursue DIY philosophies.